Face it; we are all terrified of the semicolon. Most of us pretend it isn’t even real. Ever since old Mrs. Crustenhammer scolded us for misusing one in 7th grade, we have learned just to live without it. And life has not been perceptibly less rich as a result. 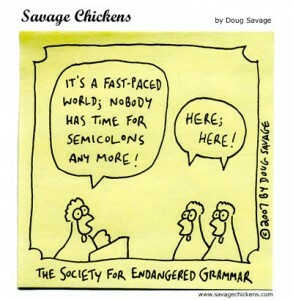 We can all get along fine without semicolons, after all. Because this is true, I always find great joy in a student paper that contains a courageous and correct use of semicolon. Eggs are versatile things; you can juggle them, snuggle them, collect them, or cook them. Notice that the clauses on either side of the semicolon could each be its own sentence. If you used a mere comma here, you’d end up with a run-on sentence called a comma splice. You could put a period there (and capitalize you). That would be okay grammatically, but you would lose the obvious connection between the two ideas. A semicolon works best in a situation like this, and that’s why you should have it in your toolbox. The zucchini was large, but Evan was sure he could eat it in one bite. If you use one of several words or compounds called conjunctive adverbs (or conads for short), you do need a semicolon. It goes before the conad, and a comma should follow it. The most common conads are however, moreover, and therefore. Vladimir prefers pasty pale skin; therefore, he wore coveralls to the beach party. My yodeling concert tour took me through Decatur, Georgia; Edison, New Jersey; and Butte, Montana. My phobias include apiphobia, which is the fear of bees; coulrophobia, the fear of clowns; and homiclophobia, the fear of fog. That’s all there is to it, so buck up. Don’t give in to semicolophobia. Mommas and Commas: Never Use a Comma Before “Be”? 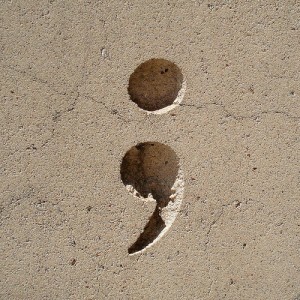 A timely and useful article; my daughter and I were discussing the semicolon just this week. I’m glad it worked out. And may I commend your excellent example of semicolon usage?